Right now I'm not thinking about how we use technology in the classroom. This post is about how we use technology as a problem-solving tool (or crutch? ), when we're working on math problems ourselves. This post was inspired by a conversation with Rick, at Exploring Binary. Rick: I have to learn to go to Wolfram Alpha for mathematical queries such as the one I mention in the article. Typing 4, 24, 124, 624, 3124 into Wolfram Alpha gives the answer I sought directly: an = 5n – 1. Sue: But then you wouldn’t have had as much fun! And I’d say that’s the problem with Wolphram Alpha. Having fun with math is often hard work. It’s so much easier to click your way to an answer. But just not the same. Rick: For me, it goes beyond Google and Wolfram Alpha — it’s the availability of computers in general. I often find myself slapping together a small program or script or spreadsheet before I sit down and think about a calculation first. Sometimes this leads to serendipitous discoveries; other times it leads to more “Well, Duh!” moments . Maybe it’s good I started my serious study of math before the computer era really got underway. When I started high school ('70), calculators weren’t yet in common use. When I started college ('74), we didn’t have graphing calculators. I remember drawing hundreds of graphs while I was in calculus. For a long time, I felt like I wasn't a real mathematician because I never learned how to use a slide rule. All the math people I knew could use one, because they'd been doing difficult calculations for a few years more than I had, and hadn't had calculators. There was no internet (in my personal life, anyway) until well after I was done with my formal education (’89). I saw a game for learning factoring, called Divisor Miser, at the Colorado NCTM conference in ‘82, I think. Someone had programmed it on a Vic-20 or TRS-80, or something like that. But I don’t remember computers being used to solve math problems in the computer course I taught in the mid-8o’s. Dan wanted to simulate an amusement park ride he calls a scrambler, and pulled up Geometer's Sketchpad. Nice results. I used the matrix solution capabilities of my TI-83 when I was solving the regions in a circle problem. (Put n points on a circle, connect each to each with a straight line, how many regions in the circle?) If you already understand the solution to that, you may think this was a totally unnecessary use of technology. But it helped me to see. I'd like to post about that problem soon. At last year's Math Circle Teacher Training Institute, this problem was posed: "Can you tile a rectangle completely, if you require that only squares are used and each square must be a different size from all the others? How?" We used Geometer's Sketchpad to play with our sketches of how it might work. I dropped out of the group thinking about this. When they presented their solution the next day, they mentioned having used Mathematica to solve some equations. Back to my conversations with Rick. The one above is on his blog. We've been having another conversation at the same time in the comments to my post about the Carnival of mathematics. I wondered about the pattern in decimal fractions, .99 in particular, when they're converted to binary. He gave me .99 in binary, and pointed out that it repeats. I started playing with the conversion by hand, got frustrated, and turned to Wolfram Alpha for assistance. (My first time using it for a serious purpose.) Without any more tedious calculations, I could think about patterns. Turns out .9 is a repeating decimal in base 2 with a four-digit repetition, but .99's representation in binary takes 20 digits. Weird. I haven't seen the light yet on that one. What do you think? Tool, crutch, or both? Check this out, by Alison Blank: Math is not Linear. Her blog is great, too. Cool graphic of a wave, made using Mathematica. Detexify lets you draw online. You draw one symbol, and it'll tell you what you drew. If you'd like to start using LaTeX online, this will find symbols for you. You can also use a site called sitmo. Maria explains that here. A few people have raved about Detexify. I'm not sure why. Is it just too cool that it does character recognition? Or is it more powerful than sitmo? Video: Bobby McFerrin on the Pentatonic scale. I looked up pentatonic on Wikipedia, and the business about hemitonic or anhemitonic was beyond me. But I liked seeing the connection with the Orff method in kid’s music education. Off the math topic, but on the I'm-writing-a-book topic: Uncertain Principles pointed me to this post about settling in to write. Rick Regan on decimal (base ten) numbers like 999 having binary representations that end in 111. I'm not fond of war studies, but the German Tank problem was a very interesting application of statistics, which I'm likely to use in my stat classes. Not part of the carnival, but up at the top of the blog, was the previous post title, on a binary marble adding machine, made out of wood. 5 dimes, times 10 cents each. My son (7 years old) says 10, 20, 30, 40, 50 while holding up fingers. So he doesn't see how ten times works yet. He's a smart kid, so this is surprising to me. I have no interest in doing anything about it. I trust he gets enough math thinking in our family to be just fine. I'm just intrigued. I'm reading Holes to my son. Am I obsessing, or would this make a good problem? "... X-Ray had his own special shovel, which no one else was allowed to use. X-Ray claimed it was shorter than the others, but if it was, it was only by a fraction of an inch. The shovels were five feet long, from the tip of the steel blade to the end of the wooden shaft. Stanley's hole would have to be as deep as his shovel, and he'd have to be able to lay the shovel flat across the bottom in any direction." On the next page, after his first successful shovelful of dirt, Stanley thinks "only ten million more to go." I'm embarrassed to say this, because it seems so obvious now that I see it. For years I've been intrigued by the fact that, when you take the derivative of a volume formula, you always get the object's surface area. Suddenly, thinking about the problem I had in mind for the Holes scene above, it was obvious to me. (Painfully obvious, considering how many times I pointed that 'cool' fact out to my students, and wondered aloud why it was so.) Don't worry if it's not obvious to you, you probably haven't been teaching calculus for the past 20 years. Derivatives measure rate of change. The volume changes in a small bit of time by adding or subtracting at the boundary. The surface area determines how much space there is for the change to happen in. Does that make any sense? No? Maybe it'll help if I get more specific. 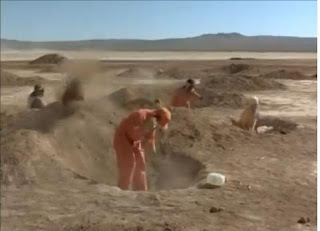 Stanley's hole has to be a certain diameter and height, and X-Ray gets to dig a hole with a slightly smaller diameter and height (the difference is called delta x in calculus). If you imagine a thin layer all around the edge of X-Ray's hole that Stanley will still have to dig out, you see that the surface of the hole is (sort of) the difference between their holes. The difference in shovel lengths is the change in x (delta x), and the difference in amount of dirt they have to dig is change in y (delta y). Change in y over change in x is rate of change (aka slope, aka derivative). If it's still not obvious, either you'll want to play with rate of change ideas more before trying to understand, or I'm not explaining well. My blog list in Google Reader is long. I'm making it longer today. samjshah wrote about making resolutions for the school year, and Kate mentioned "...blogs we all read". I wanted to have a list of all the math teacher blogs. Sam pointed to a list at Moving Forward. They both said looking at people's blogrolls is better than any attempt at a comprehensive list. But the list at Moving Forward is great. Maybe Scott McLeod is weeding out the not-so-great ones. Enough for one day! I've added the blogroll widget so you can see my list. What math lessons would you offer to elementary teachers? I may get to be part of a project that would help elementary teachers learn more math. Right now it's wide open. What would you teach them? Or if you're an elementary teacher, what would you like to learn? Is it back to school for you this week? Or are you still enjoying summer vacation? Maybe you’re an unschooler who enjoys math, and there is no on button for school! Whoever you are, enjoy the feast! We have money problems (doesn't everyone? ), a dish of art with math on the side, probability and statistics, factors and primes, problem-solving, and a miscellaneous bunch at the end. In the United States the number of actual teaching hours (not planning, not meeting, not improving) is almost double the number of hours in Finland, more than double Japan, and the greatest in the world. Look at the data, read the analysis, over at 3σ -> left. Maria Miller, at Homeschool Math Blog, has great ideas about how to help kids Learn to Recognize Coins. Chad Orzel, at Uncertain Principles, offered an estimation contest; Mary O'Keefe, at Albany Area Math Circle, analyzed the contest, first in terms of winner's curse, and then in terms of information cascades. I chimed in with some ideas about improving your estimation skills. The contest's over, but the posts are still fun. Tanya Khovanova presents a group of puzzles about weighing coins, and explains the concept of 'revealing coefficient', in her post titled Unrevealing Coin Weighings. Here's a math, art, and literature resource I found while wandering around Math Hombre's blog. Make your own One Page Wonder, a story book that can be read in lots of different orders. The geometry of it is mind-boggling. Hmm, I like writing, but I'm no good at drawing, I wonder if I can do this... It reminds me of some weird form of poetry. The best lessons seem to produce lots of noise or none. Ryan O'Grady has a lovely one, The Quietest Lesson, analyzing first bad jokes and then other writing samples, to find average word length and average number of words in a sentence. The same sort of analysis, Stylometry, was used to determine the authors of some of the Federalist Papers, and some writings that might have been by Shakespeare. Mr. D's (I Want to Teach Forever) Deal or No Deal game in the classroom sounds like lots more fun than that TV show. And he's got some more ideas to make teaching and learning probability fun and successful, including 3 fun probability games and projects. And I figured Jonathan's (jd2718) puzzle belonged here, because I think it takes the kind of counting we work so hard on when we're figuring probabilities. Jimmie thinks of blogging as electronic scrapbooking. At Jimmie's Collage, she's posted a great article, collecting resources for Living Math with Factors, Multiples, and Primes. John Golden, at Math Hombre, gives us a word game and a factoring game that are both about Running Out of Options. Math hombre gives us a good introduction to Polya, and calls those steps phases because he wants us to know we might need to go back and forth between them. He also recommends an article by Alan Schoenfeld. I'm hoping to post a review of Schoenfeld's book, Mathematical Problem Solving, soon, and was excited to see that link. I can't leave the topic of problem-solving without mentioning Paul Zeitz, whose book, The Art and Craft of Problem Solving, gives a whole new take on how to think about it. He talks about strategies, tactics and tools, and then offers some killer problems to help you practice the tools, tactics and strategies he shows you. Oh yeah! Evelyn Saenz loves to blog about frogs. Frogs for skip counting, frogs for game playing, and frogs in their natural habitat. Her contribution comes to us through her Squidoo lens, but she also has her own blog, Hands-On Learning. Sam Alexander, aka Glowing Face Man, has written a great post about applications of higher math: why scratches on cds don't interfere with them playing well, how search engines work, and modern encryption. • There's a totally approachable book about Fourier Series called Who is Fourier?, by (get this!) Transnational College of LEX. This group is interested in learning lots of languages, and when members wanted to understand language, they decided they needed to understand sound. That's usually done using Fourier series. They researched the topic, and ended up writing their own refreshing text on it. I was reminded of this lovely book when I happened across Matt Springer's blog Built on Facts, with his Sunday Function, most of which addresses using Fourier series to mimic a simple periodic function. • Marcus du Sautoy is one more voice added to the chorus of folks saying there's lots more to math than what you see in classrooms. • This last post will become my reference list each time I'm deciding what to learn next among the technological wonders available these days. My goal is to be totally tech-savvy in my classroom next year. Maria Andersen taught a Technology Boot Camp at Muskegon Community College (my old stomping grounds), and gives us a rundown. The next Math Teachers at Play blog carnival (#15) will be hosted my Maria Miller at Homeschool Math Blog, on September 4. Submit your blog article using the carnival submission form. Past posts and future hosts can be found on the blog carnival index page. I saw a few comments in my blog reader on first day activities over at dy/dan, First Day Wiki ('07) and This New School Year ('08). I loved his ideas. I have a few of my own you all might like if you're headed back to teaching. (The sabbatical work I'm doing is marvelous, but I am going to miss teaching!) Dan taught high school and I teach at a community college; perhaps that has some bearing on what we do differently first day, but there's lots of overlap. • On my last first day, in January, I put this on the board: “My ideal math class is a learning community. My goal is to help you become a community of learners." I also asked them to each add something to their choice of one of 3 lists on the board: 'Something I know in math', 'something I don't get', 'something I'm curious about'. • I think it's important to try to call on people as equally as I can. (See Failing At Fairness for research that shows how much more boys are called on than girls, and how differently they're responded to.) I tell them the first day: I don't want to intimidate you, so you can always say 'pass' if you don't want to answer. But if you want to be brave, you shouldn't pass just because of not knowing the answer. You can say "I don't know", and I'll ask you easier questions and we'll work back up to the original question. I still end up asking questions to the class as a whole sometimes, and when the same 3 people raise their hands all the time, I start telling them I'll wait for other hands, in order to ‘spread the wealth’. • It's vital to learn your students' names, but I have a bad memory. In recent years, I've brought my digital camera, and taken pictures. I found it used up too much time if I took the pictures, so now I get a volunteer to be the photographer. They can do a photo of 3 people at once, and afterward I organize in iPhoto, copying and cropping, so I have head shots of each student. I print and have the students put their names on their photos during the next class. Then I get to cut them out and use a glue stick to put them on those 3x5 cards. That work with the photos helps me get started with learning the names. • I send around a sheet of paper with my name, phone number, and email. I suggest they add theirs to the list if they want, and tell them no one has ever had problems from it that I know of. Then I copy the list, and give it to them. I talk about how studies have shown that students who work in groups do better. • I offer ‘donut points’ for catching me in mistakes, so that they’ll question what I’m presenting, instead of assuming it’s right just because the teacher said it. After the class has caught me 30 times, I bring in donuts. • I ask them if they think you need a good memory to learn math. Most think so. I tell them about my terrible memory and say it's all about connections and understanding why things work. I made a poster that says: ‘Real mathematicians ask why’. It's in my classrooms and my office. • Last year I was working way too hard to have time for correcting homework. They have answers in the book of the book, so they don't need me to correct it. They just need me to give them credit for doing it, so that it gets high enough in their priority lists to get done. So (I learned this from a high school teacher at Middle College High School which is housed inside our college. Thanks, Eric! ), I stamp their homework. (Buy a self-inking stamper for this.) If the homework is complete, or close to it, they get two stars. At least halfway there gets one star. They turn it all in at test time, and I record the number of stars. I can do that while they're taking the test. • Some classes get the math autobiography assignment. Lately, though, I've gotten tired of it, and just offer it as extra credit. • College textbooks are outrageously expensive - generally over $100 for math texts. My goal is to use the textbook as little as possible. So I told my beginning algebra students that they didn't have to get the official textbook, but could buy any Beginning Algebra text. I changed my homework sheet to show the topic names, and told them to pick 10 problems from their book on the right topic. Lots of students have tried to come to class with no book, because they couldn't afford the $100-plus. Now they didn't have an excuse to have no book. We discuss where used bookstores are, and online sources for used books. • Send email before semester begins. 2 days before gives them a day to get their book. • Put students in the position of teaching what they’re learning. • Ask at end of class: ‘What’s the most interesting thing you learned this week? • Have a question for them each time you walk into the classroom. • One teacher pairs students up and has them fill out a form which starts "I am my brother's and sister's keeper. I will help my partner succeed. I commit to..." Then there are 3 blanks, and th pair discuss how they can help each other. If one is absent, she'll ask the other about it. Sometimes even the spam is interesting. I'm working on the next issue of Math Teachers at Play, which goes up on Friday. So far I've gotten 4 real submissions for it, and about 20 spams. The spams are things like '50 tips for teachers', and '100 great online college degree programs'. I check each one to see if it would fit our blog carnival. Usually the title is enough ... Delete. So today I got one that was something like '50 serious educational games'. I thought it might be worth checking into whether there were any good math games. One said it was math, but it didn't look promising. There was a science game, though, that got me excited: FoldIt. It's real science, protein folding, and it looks like it might be an interesting game. It sounds like something I might even call math, since it's about space and shape issues. An even bigger bonus: Apparently, people playing the game may even be able to help further the study of protein folding, by helping the researchers understand how to tell computers what to look for (if I'm understanding this right). What s hape will a protein fold into? Even though proteins are just a long chain of amino acids, they don't like to stay stretched out in a straight line. The protein folds up to make a compact blob, but as it does, it keeps some amino acids near the center of the blob, and others outside; and it keeps some pairs of amino acids close together and others far apart. Every kind of protein folds up into a very specific shape -- the same shape every time. Most proteins do this all by themselves, although some need extra help to fold into the right shape. The unique shape of a particular protein is the most stable state it can adopt. Picture a ball at the top of a hill -- the ball will always roll down to the bottom. If you try to put the ball back on top it will still roll down to the bottom of the hill because that is where it is most stable. I just discovered Alan Kay. You can read his bio at Wikipedia, or watch him give a TED talk. But I'm posting about him because I was fascinated by his thoughts on science, why it's counterintuitive, and how we might teach it better. Sounds like some of what I'm trying to get a handle on about math and how to teach it. His thoughts about what science is seem to run in the same direction as my thoughts on what math is. I hope to post more on this later. Adults and children just love "being creative" and "expressing themselves". And, this is especially the case around the world when computers are introduced with applications that allow people to make things. I think it is possible to do the real deal with children, and we've managed to show this (for example, with the Galilean gravity investigation [Sue's note: this is shown in the TED talk]). The ability of the computer to do simple incremental addition very quickly gives us a differential mathematics that is completely understandable to the children that is also fast enough to carry out the integrations over time directly in real-time. For 10 year olds, this is really good science, and I would neither advocate them being less nor more rigorous. Adding the blog of Albany Area Math Circle to my Google Reader has added delight to my mornings. I'm seeing so many fun problems on there! Yesterday she linked to one here with a picture that begs you (well, me at least) to start computing. Guess the total dollar value of the change in this box, and win a galley copy of Chad Orzel's soon-to-be-published book, How to Teach Physics to Your Dog. He's posted the answer. I was way low. As was the average answer, dubbed "the wisdom of the crowd". Orzel asks why. I'm thinking we tend to estimate low on money. What would help us estimate better? And then he recommends estimating often, committing to your estimate somehow, and then finding out the real value of what you estimated. For example, estimate your arrival time when you're in the car, tell the person next to you, and notice the time when you do arrive at your destination. Anyone have other ideas about how to help others, and myself, learn to estimate better? Anything you'd add to this if you used it in a class? I'm very happily involved in a grant application that would allow me to work with the local elementary teachers, improving their understanding of math. Wish us all luck. Just a few cool links, really, before I run off for a week at family camp, with no internet. In my morning explorations today I also rediscovered the blog of the Albany Area Math Circle, which looks like it's full of intriguing posts. First I found Hangmath, which looks like a very fun game - I'll look forward to trying it with students in September. And then, in the next post down, she described something I heard about earlier this summer, and have been meaning to explore further. While I was attending the Math Circle Institute, Amanda Serenevy gave us a leaflet about a project she'd developed for her Riverbend Community Math Center, about taking a math walk in South Bend. I can't find it now, but it looked intriguing and is another activity I'd like to try out in September. So I was excited to see Mary O'Keefe's post on Math Walks. Most math walks involve arriving at various destinations and solving some puzzle (or math problem) presented by what you see at the location. O'Keefe's is more focused on the history of her campus, and a local mathematician. Googling 'math walks' found me this post on the Futures Channel, about Ron Lancaster's work. I noticed that he uses the term math trail, so started searching on that. Here's a site I'll come back to when I'm ready to set up my own math trail. I also found this on Wikipedia, about Kay Tolliver, who's won a Presidential Award for her teaching. She started the National Math Trail project, where students and teachers can post information about math trails they've developed. Anyone find any exciting math trails near them, or have any experience creating or using one?